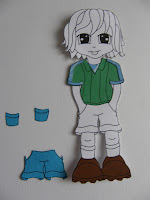 I show you how easy it is to dress up a digi image, is this called also Paper Piecing. 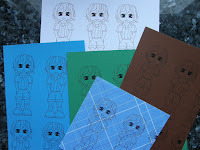 Just take several copies from your image and print them on different patterned papers. Then cut the pieces and clue on the base image, you should colour the skin first what I didn't do! And there's still some pieces to another card. 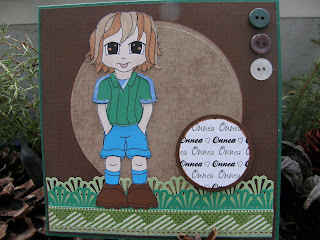 It was Digi Day in SNR yesterday and I did this card with Digital Delights Soccer Jamie image and use that GREEN ! Tässä vähän kuvaa miten helppoa on pukea digikuvia! Tulostin useamman kuvan erivärisille papereille ja leikkasin ja liimasin osat vartalon päälle. Kannattaa ensin värittää iho ja hiukset! Great card, Cheryl and really useful instructions. Thanks for joining us over at Cards for men and good luck with the challenge. En ole koskaan vielä "pukenut" leimakuvaa - meinaan kyllä kokeilla! Great male card and tutorial! Thank you for joining us this week over at creative inspirations and good luck. great card thanks for joining us at creative inspirations this week. Great male card, love the image. Thanks for joining us at Creative Inspirations this time.